Well, June 2015 felt like an over-excited April: rain, rain, and more rain. I have logged a few indoor cycle training rides but have nothing close to a great base. My Time Trial will be more guts and grit than being a well-planned for, well-trained for race. While, I might be painfully grinding through the gears, the great thing with this QUAD event is that my son gets to participate! During the swim, I was under the weather and didn’t want to try to drag Roger up to Edinboro from Pittsburgh for an almost 4 hour round trip car ride plus arrange for someone to watch him while I swam. For the Kid’s Bike Ride – the YMCA offers child care plus my husband will be joining and able to watch our little sweetie while I ride. I think Roger will love seeing all the bikes and people participating. He is a friendly, adventurous little guy. Despite his cast (which thankfully comes off soon), he has probably logged more training miles than me. 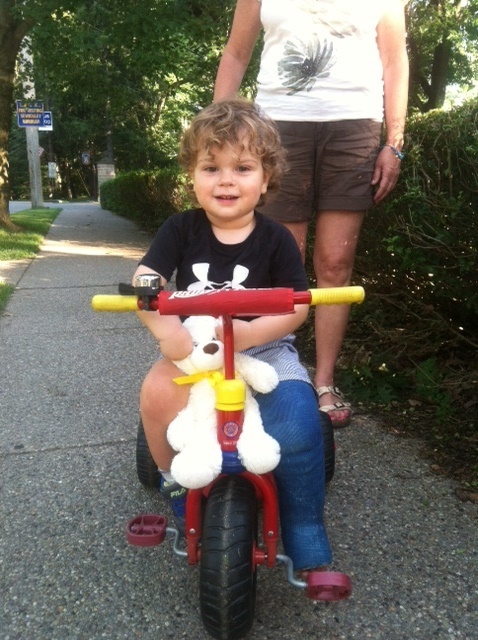 Look out for this little trike-riding toddler on July 11! I hope everyone is looking forward to the beautiful course and chance to challenge ourselves on 2 wheels.